Magub gro-Orum, an Orc warlock, is a member of the local skooma-dealing ring in Cheydinhal. The other members are gang leader Dulfish gro-Orum, Bazur gro-Gharz, Borba gra-Uzgash, who runs Borba's Goods and Stores, and Oghash gra-Magul, who runs the drugs to and the money from the local Camonna Tong representatives. When asked about Cheydinhal, he will provide map markers for Fort Facian and Fort Naso. Oghash and Dulfish are the ones in charge of the drug trade, so Magub spends most of his time hanging out with the other gang members and relaxing in downtown Cheydinhal. He shares his house with Dulfish and they both sleep in the upstairs area. Magub wakes up at 6am and spends the first two hours of the day wandering around near his bed. At 8am he heads to the Great Chapel of Arkay where he receives a single blessing from Akatosh and sits on a pew for two hours. After another two hours at home, he takes his lunch at the Newlands Lodge with all the other Orcs and regulars. At 2pm, if the weather is clear, he will stroll around the area between the east gate and the graveyard next to the chapel. If it is raining, he will spend the afternoon in his house. At 8pm he returns to the Lodge for a two-hour dinner before he heads back home for a bit of wandering before his bedtime at midnight. Magub wears a middle-class outfit consisting of a burgundy linen shirt, tan linens, and a pair of pigskin shoes. He carries the key to his house, as well as a medium amount of gold. He knows the standard leveled Warlock spells, as well as all major Destruction spells. With the exception of Borba, all the Orum gang members are unusually rude, even for Orcs. Magub is no exception and will introduce himself like this: "Yeah? I don’t care who you are. I ain't talking to you. You ain't from around here. So push off." Should you first meet him in Borba's Goods and Stores then he will introduce himself like this: "Me? I'm Magub gro-Orum. Borba and me, we were pals in the adventuring trade. Now I help him run the store." He will, however, add two markers to your map when you ask him about Cheydinhal: "Treasure holes near Cheydinhal? Not close by. Fort Naso and Fort Facian, though... bad news. Undead, and then some. But far out and foul enough, you'll get plenty of action." On subsequent meetings, he will reject you with the words: "I'm done talking to you. You ain't listening. I got better things to do." There seems to be some disagreements on this character's name. The NPC's name in the editor is "Magub gra-Orum", which is a female name. However, the name you see in the game is "Magub gro-Orum", and he's male (with Orc names, "gro-" always means male and "gra-" always means female). To further complicate matters, he lives in a house called "Magrum gra-Orum's House", which is another female name, but there is no "Magrum gra-Orum" anywhere in the game. He also shares the house with "Dulfish gro-Orum", who is unquestionably male. They are both very rude and refuse to talk to you much, so the nature of their relationship remains a mystery. One theory is that Magub was originally supposed to be Dulfish's wife, but was changed to a male for some reason. It is assumed they are brothers. 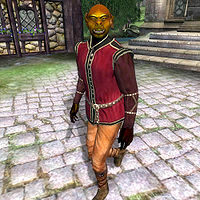 This issue has been addressed by the Unofficial Oblivion Patch; the house has been renamed to "Magub gro-Orum's House". Esta página foi modificada pela última vez à(s) 13h42min de 3 de março de 2014.